Join us for one of our trips described below. New Orleans! Service with Joyeaux de Vivre! Book the Merry Green Marvel for group service projects within a 70 mile radius of New Orleans. Our work will primarily focus on wetland restoration with some work focusing on poverty and homelessness and youth support. This may include work planting cypress trees and wetland grasses, erosion mitigation, habitat restoration including invasive plant and debris removal, home building and rebuilds, food banks, shelters, and supporting after school programs. 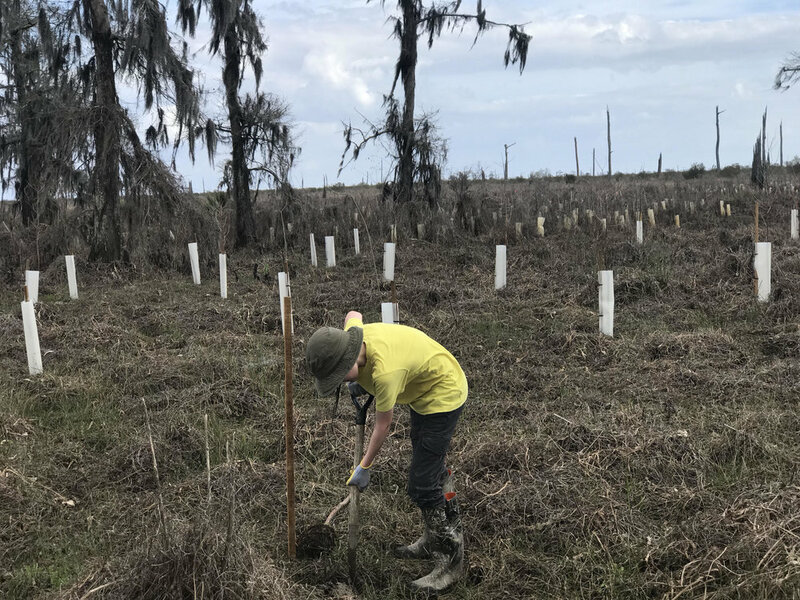 Wetland restoration work includes an educational workshop presented by local experts that explain the land loss issues facing Southern Louisiana and how that affects the whole Mississippi watershed. We emphasize a deep community and cultural immersion that includes a variety of service work but also a chance to meet and learn from a diverse array of folks who share about the issues we are addressing in our service work and give us a personal doorway into the rich culture that is Southern Louisiana. Though we can often extend trips longer or shorter, our service weeks generally run from arrival on Saturday eve (the bus can pick you up near the New Orleans airport or other transportation hub such as Amtrak Station) with Drop off/Departure on Thursday night. We generally work Monday through Thursday, with Sunday as a day to explore the culture of “New Awlins” through Food (cooking class taught by Chef Joe of Cafe Reconcile, an inner city culinary school) and Music (immersion into the street music and the relevance of New Orleans and the Delta as the tap root of the American musical tree. We often have the opportunity to meet and learn the tradition of the Mardi Gras Indians. We also often work in a tour of Congo Square when there is live drumming.) We also offer a cypress/tupelo swamp paddle during the week with canoes and/or kayaks. As the week unfolds we often get to meet some of our Cajun country neighbors who have been known to offer their hospitality in laying out some Cajun cooking! Wetland restoration projects occur during tree planting season which runs from November-March. For many of our Southern Louisiana projects the bus will park and camp at the Rosaryville Retreat Center where we have been welcomed to use their grounds for bus and tent camping, a pavilion for cooking and dining, and a bath house for showers and toilets. A similar situation exists for us using a church facility in New Orleans. We welcome one large group or a combination of smaller groups of volunteers that can create a full bus crew of up to 28. This combination of volunteers from different places and backgrounds often adds to the richness of the experience. An advantage of getting on the bus for your service week is that you get transportation, housing, food, project, participant insurance, cultural and social awareness sessions with a guest speaker from the community we serve, reflection time through journaling and personal growth sharing sessions facilitated by Merry Green Marvel staff as requested. For an additional $20/trip we offer a rental sleeping bag and towel so you can pack lighter. Cost for this 5 day trip is $58/person/day or $290/5 night-trip. This includes all volunteer projects and meals except Sunday lunch which volunteers can find while walking the French Quarter. In addition it includes lodging accommodations on the Marvel Sleeper Coach Bus or provided tent camping when appropriate. The cooking class and swamp canoe tour are also included. Feels good to plant trees! Day’s work to look out across! Imagining the trees we plant growing into a forest like this. Sign up for our New Orleans trip. We'll get in touch with you to finalize the details. This trip can be flexible to your group needs as to pace, overnight accommodations, meals cooked on the bus kitchen etc. We suggest starting this trip on Sunday morning in New Orleans by attending a gospel church service and then visiting Congo Square in Louis Armstrong Park where we may be lucky enough to see the drummers and dancers that still gather there on Sunday afternoons. There we begin to understand the power of the place where so much of American music has its roots. From Congo Square we roll out of New Orleans make our dinner and camp for the night. Monday morning we take in the Whitney Plantation Museum devoted to slavery and take a guided tour. From there we’ll attend the Mississippi Civil Rights Museum in Jackson and camp near Memphis. On Tuesday morning we’ll tour the National Civil Rights Museum at the site where Dr. King was slain. Out of Memphis later on Tuesday we’ll stop in Holly Springs, MS to meet the Kimbroughs family where’ll they’ll take some time to talk with us about Blues music before camping for the night. Wednesday takes us over to Birmingham where we’ll spend the morning touring Civil Rights Landmarks including Birmingham Civil Rights Institute, Kelly Ingram Park, and 16th Street Baptist Church. 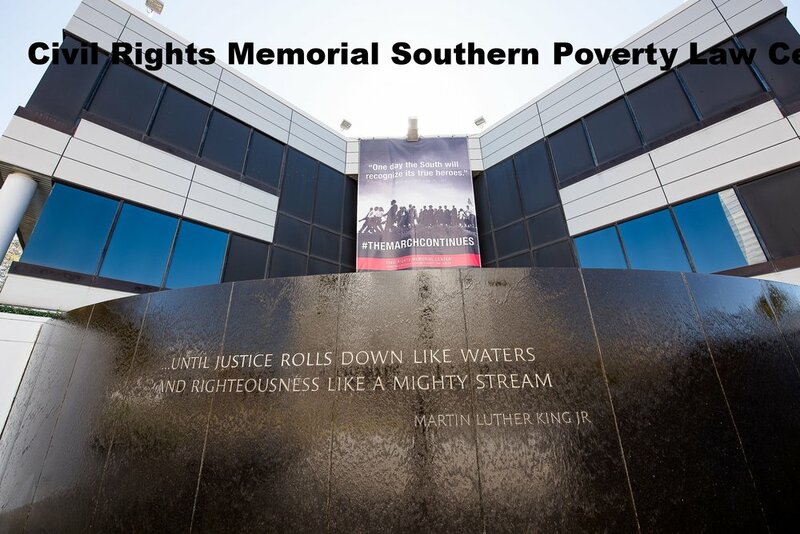 Thursday has us driving down to Montgomery where we’ll see the Rosa Parks Library and Museum, Freedom Rides Museum and the Civil Rights Memorial Center. We’ll drive out of town toward Selma and park the bus along the route of the march from Selma to Montgomery and camp near the same spot the marchers camped. Friday has us in Selma where we’ll learn from local guides the significance of the Selma marches. After learning about Selma we’ll give back through a service project in Selma. Saturday morning we can visit the Gee's Bend quilters before departing for New Orleans with an arrival back in New Orleans Saturday evening. This trip can be modified to meet your group’s needs. Ask about our pricing based on your group and the extent of your trip. 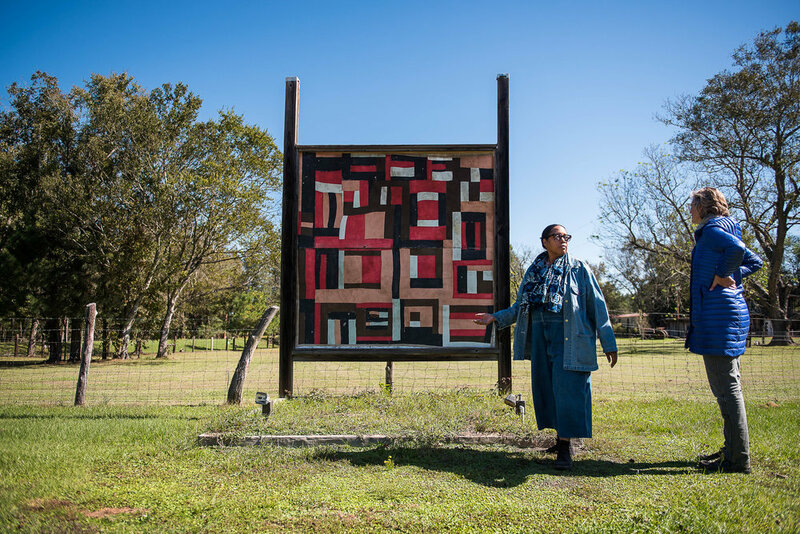 The beauty of quilts and small town economic initiative! Joanne Bland was part of the Selma marches when she was eleven years old. 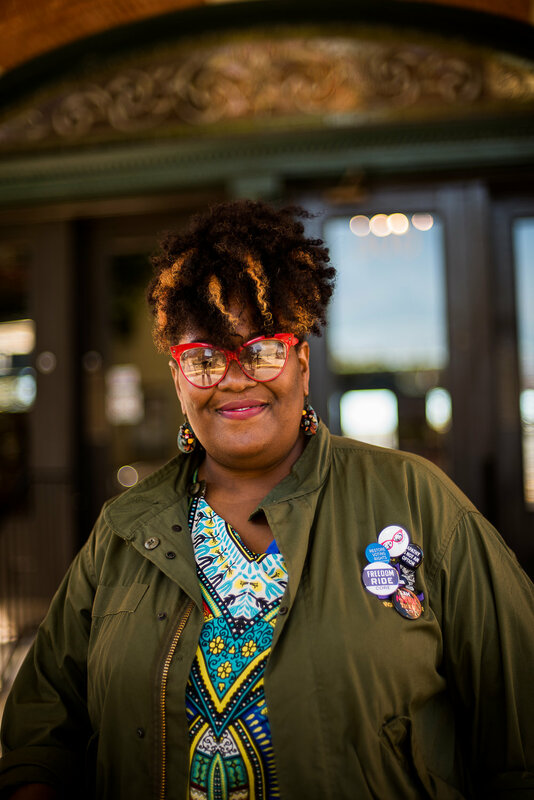 She now leads Journeys for the Soul in Selma, a living voice of history. Every Sunday afternoon in Congo Square, New Orleans drummers and dancers still gather to carry on the 200 plus year tradition of gathering to drum and dance, giving roots to the tree of American music. Sign up for our Deep South 2018 trip. We'll get in touch with you to finalize the details. This trip will focus on learning about the Lakota culture through the collective heart of service and sincere inquiry. The openness and respect to learn about another culture will be essential to this trip. We will have the honor to receive cultural teachings from locals. Depending on the timing of the trip we may have access to a pow wow, sweat lodges and other cultural ceremonies. Service work is largely fluid depending on the time of the year, vagaries of the day, weather etc. and may include home builds and repair, youth work and environmental restoration. The Merry Green Marvel Bus will set up as a campsite on the reservation where we will cook our meals on the camp kitchen and share our food with our new friends and teachers. The minimum four days time at Pine Ridge might be combined with otheer area attractions that include: Black Elk Peak, Crazy Horse Monument, Mt Rushmore, Jewel Cave, Wind Cave, Sylvan Rocks Climbing School, Geology/Archaeology features, horse trail riding, Devil's Tower and the Badlands. This trip can be be booked as a group with a minimum of 20 people May-October. Ask about our pricing based on your group and the extent of your trip. Imagine getting a group of friends and/or family together and exploring Wisconsin waterways. You could create anything from a week end paddling/camping trip to an extended canoeing/kayak odyssey around the state. For example a week long trip aboard the Merry Green Marvel bus could begin with canoeing, hiking and camping in the Kickapoo Reserve http://kvr.state.wi.us/Home in the limestone ledge country Driftless Region before journeying up into Northern Wisconsin for Ojibway cultural teachings to help us gain an appreciation and awareness of these Northern lands and waters and how we can grow in heart and mind from these adventures. We could use https://www.lostcreekadventures.org/ to train, outfit and guide us as we explore the sea caves on Lake Superior near Cornucopia. Then onto the Brule River where we could use http://brulerivercanoerental.com/to make our way down the Brule. These paddling destinations all adapt to your level of paddling experience, ability and willingness for challenge. We encourage and aim to welcome and support ages from 14 on up. Intergenerational! Throughout the week we'd be on the bus and together preparing grand meals (mainly vegetarian, local and organic) from its pull out kitchen. You can choose to sleep on the bus or pitch a tent just outside. Campfires, singing and storytelling will be the exclamations on these glorious days of Summer in Wisconsin! We aim to put together a package for you that suits your group and your budget! Make some deep memories in the beauty of the Wisconsin outdoors! Ask about our pricing based on your group and the extent of your trip. What are you doing with the pulse of your marvelous life?!? Get on the Bus!